Romitaman Original Comic Book Art :: Private Collection :: Amazing Spider-Man 243 Cover SOLD SOLD SOLD! by artist John Romita Jr.
Click Here To See Amazing Spider-Man #243 Comic Book! 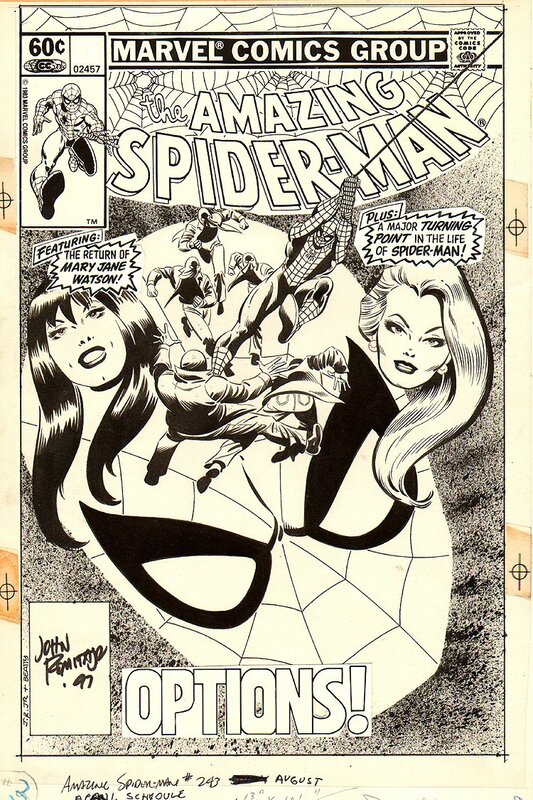 Check out this very cool 1983 AMAZING Spider-man cover, which was penciled by the great John Romita Jr., and inked by John Beatty, from the story titled: "Options!" This nice cover features a HUGE SPIDERMAN HEAD used for the background, as Spider-Man swings and beats up a bunch of bad guys from the Universal Liberation Army! 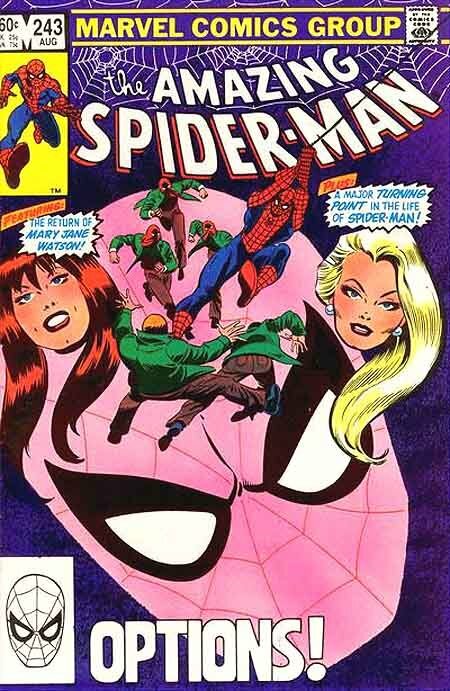 As an added bonus to this cover, we see nice head shots of the Black Cat [Felicia Hardy] and Mary Jane Watson! John Romita Jr. Covers from his original 1980's AMAZING SPIDER-MAN run are next to IMPOSSIBLE to find for sale on the open market, so don't miss out on this absolute DOOZY of a cover! ALL HIGH end pieces of art, including this one, are able to be purchased with VERY fair time payment plan options, and trades are always considered towards this and any other pieces of art on my site here! Just send me an email and we can try to work something out. Compare this nice cover art to the published comic book in the red link above, COOL!